Want to make your own desk calendar? Need to make a photo calendar to add some individuality to your workspace and organize your day but don’t know how? 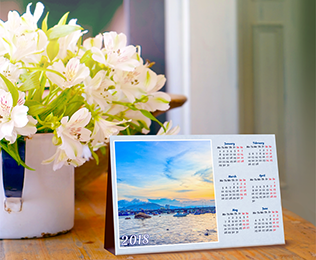 A personalized desk calendar will fill your day with good emotions and help you to keep on track. You can also make a special design for your customers and use it as an advertising weapon. Turn it into a giveaway and make profit of this marketing opportunity! So how to make a desk calendar so that the process doesn’t take too much of your time and effort? 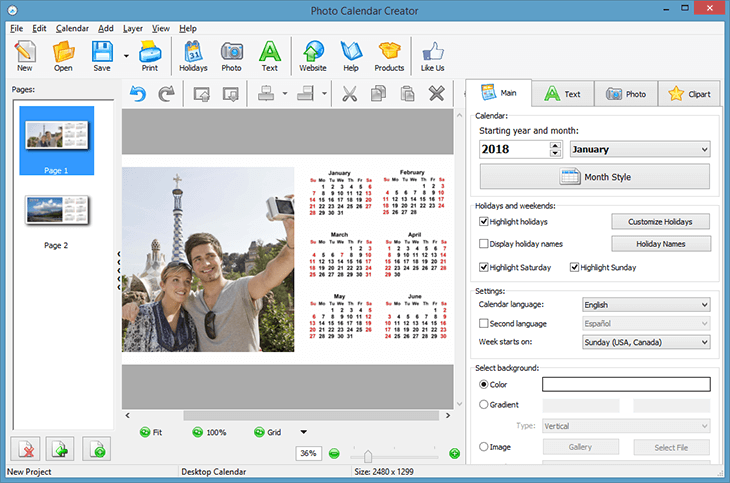 The best personalized calendar maker available on the market allows you to choose a ready-made template and customize your table calendar with photos, captions, clipart and more in a couple of minutes. Check out this video guide and read the written tutorial for more tips on designing your own calendar. Read till the end and you'll see some gorgeous desk calendar examples! In the Calendar Design Wizard, look through the offered templates and pick one of them. Start your desk calendar design with any desired month or year – January doesn’t have to be at the head of the list. 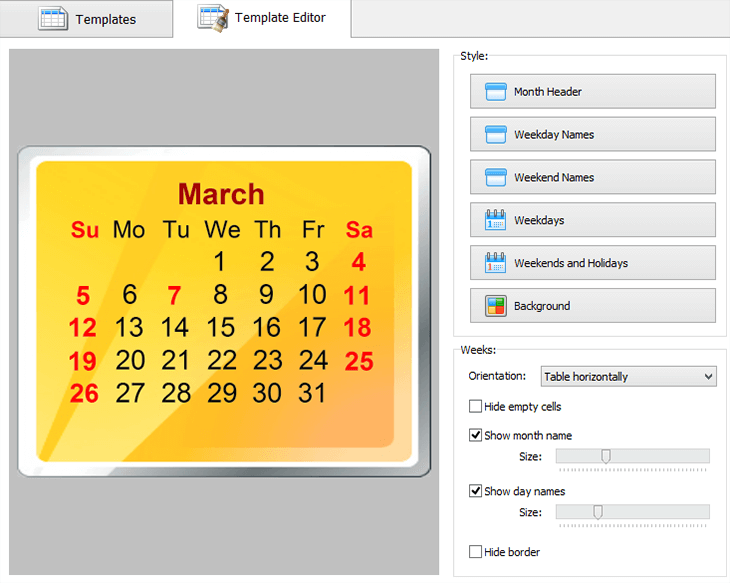 Then adjust the Calendar Properties – choose the proper size, width and height of your desk photo calendar. 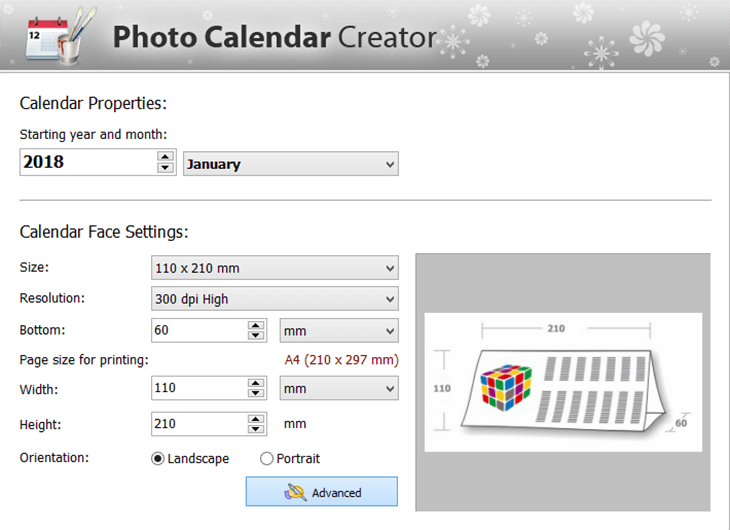 Do not forget to tweak the Advanced settings to make sure the calendar will be properly folded once printed. The preview image on the right shows you the dimensions of the calendar sides and bottom. The page size for printing is shown to let you know what paper size you’ll need. Move to the Photo tab to replace the default images with your own. Just add the ones you like and arrange them on the calendar page. If you are not sure whether a certain picture will look good with the chosen template, remember that the software has built-in crop and photo enhancement tools. 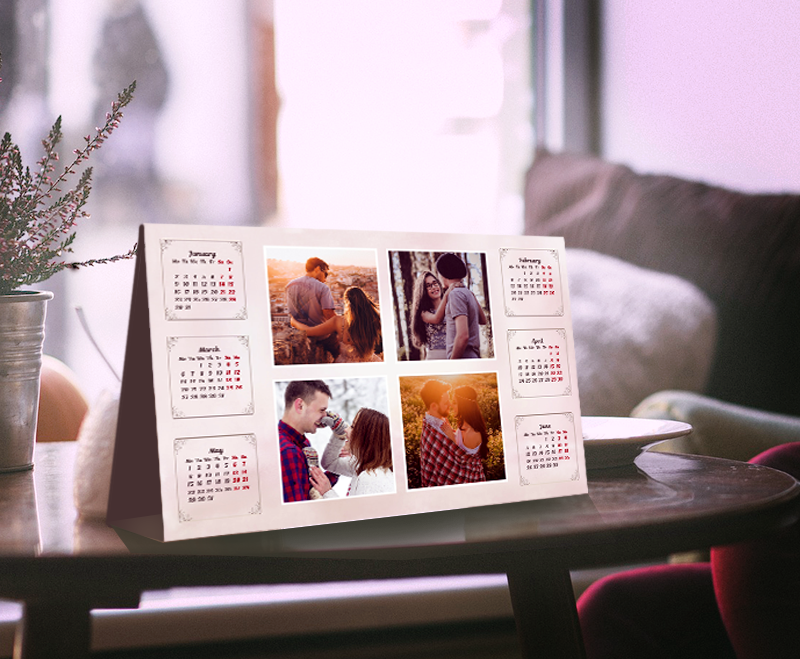 To create a truly memorable design, you can add a photo collage and make each page of a personal photo calendar one-of-a-kind. Click on the photo and go through the editing tools on the right, in the Photo tab. Replace the photo if the one you chose originally now seems out of place. The Drop Shadow option allows you to make the photo stand out against the background. Add a mask or a frame, and your calendar will look more refined and professional. Finally, try adjusting Brightness and Contrast if your photo is a bit too dark or dull. How to make a desk calendar with a customized month grid? Open the Month Style editor to find a perfect month table design for your calendar. Choose a strict grid with cells, a layout with horizontal lines, or a bright month template with a background image. Then in the Template Editor select a color for the month header and the grid, pick a font for the month and weekday names. You can also insert holiday names into calendar cells and even add a picture to any cell. 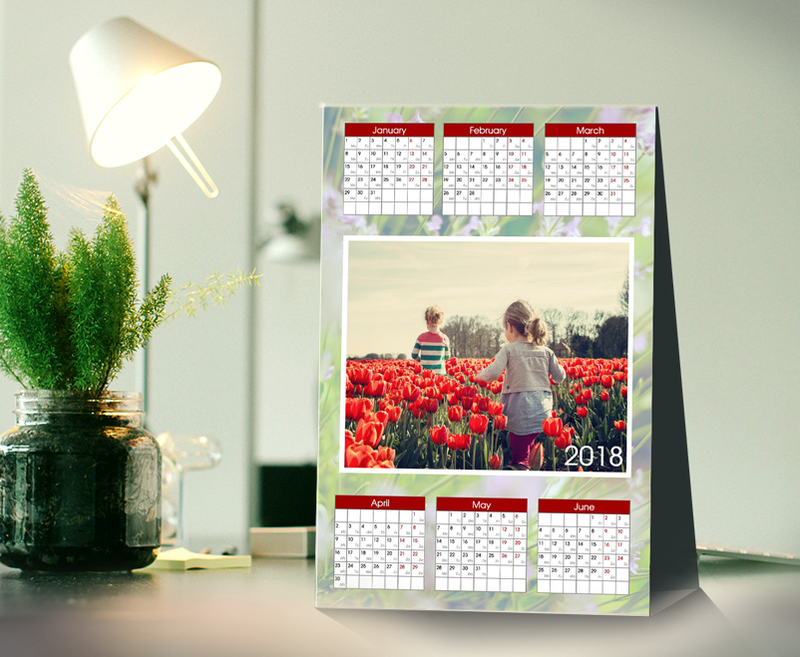 When you have finished editing the look of your desktop photo calendar, save your design as image or as a PDF file to take it to the print shop. You can also print it right at home and place it at your desk freshly printed. 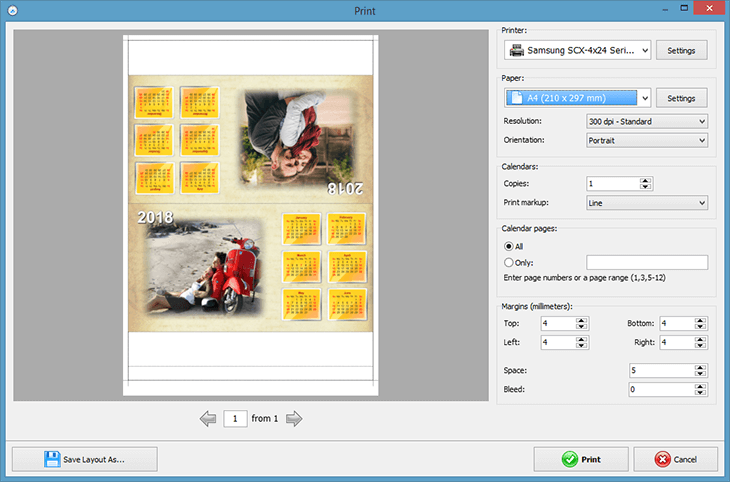 To do that, click on the Print icon and select the necessary paper size and 300 dpi for the resolution. Are you making a promo calendar for your business product? Print the necessary number of copies instantly so that each of your customers gets one. 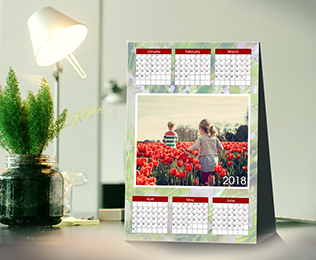 A typical desk calendar comes in a horizontal form that makes it more stable and provides enough space for all the important information as well as eye-catching imagery. One of these personal photo calendars can be easily found on a desk in someone’s office or a home study. Unlike the previous type, this calendar has a vertical orientation so it is easier to position on your cluttered-up office desk. Its form also gives you a chance to insert portrait photos into the design and further decorate them with various embellishments. In the end, the initial photo will be still clearly seen. Among the other personalized photo calendars we have been discussing here, a desk calendar with a picture collage is one of our faves! 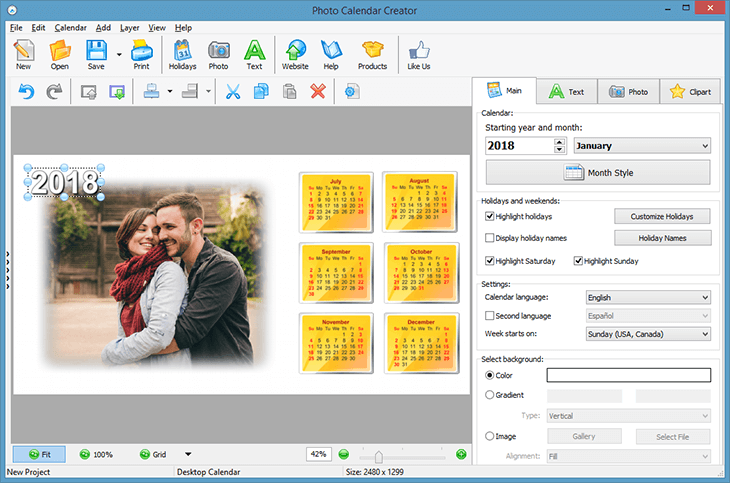 That way you will be able to use more than one or two photos in your calendar design. What is more, this stunning type of desk planner is much likely to serve as a gift. Starting every new day with a smile is a formula for success. Since you have learnt how to make a desk calendar, there should be no challenge for you to become a high achiever. 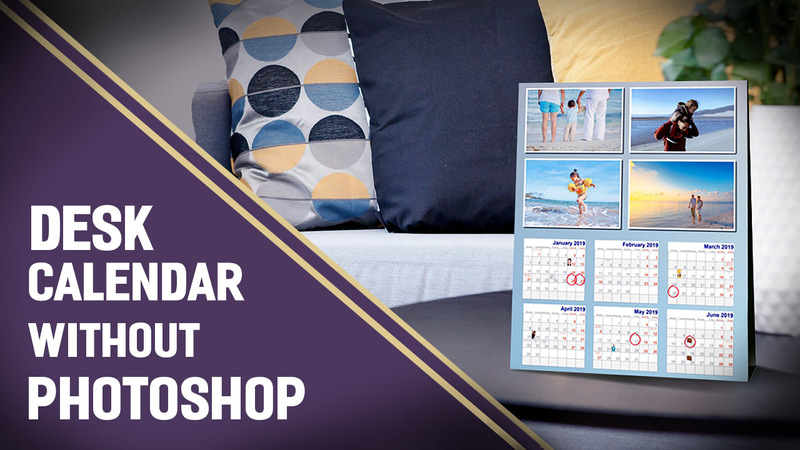 If you are eager to create personal calendars with photos, hurry up to meet the year head-on. 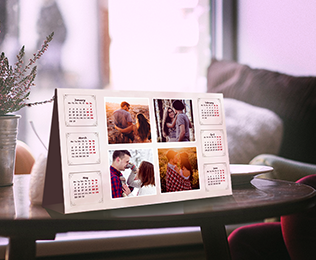 Enjoy your favorite photos in a customized high-quality calendar every day!